Great Red Dragon - MBIA AMBAC What's Up? MBIA AMBAC What's Going On? Here's a look at the charts. 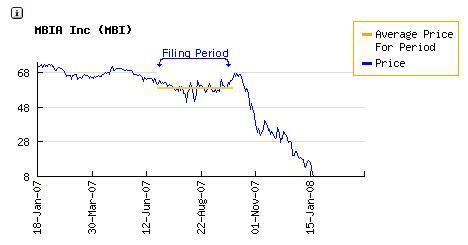 MBIA closed at $8.55 as of 4:30 Fri 1/18, down 85.52% since 9/30/07. 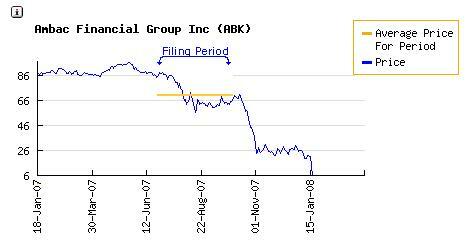 AMBAC closed at $6.20 as of 4:30 Fri 1/18, down 91.09% since 9/30/07. Now, click on each image and note who SOLD, and who BOUGHT. NOTE: The cut-off at 500,000 shares was simply arbitrary. The tables below shows who were the TOP 10 Major Holders as of 9/30/07. Be sure to check out to see who's in the TOP 10 at the rating agencies, too. Did somebody simply pull the plug? It's your call. NOTE: Third Avenue manages a fund that controls 4.37%. Vanguard manages two funds that control 4.01%. Fidelity manages two funds that control 3.01%. Cramer Rosenthal McGlynn manages a fund that controls 1.56%. Therefore, the TOP 10 control over 71.36% of MBIA. Fidelity manages two funds that control 5.89%. Goldman Sachs manages a fund that controls 1.98%. Davis manages a fund that controls 1.96%. Putnam manages a fund that controls 1.25%. Waddell & Reed manages a fund that controls 1.05%. Barclays/Associates control 26.33% of AMBAC.